Tilly and the Wall bring a certain kookiness to the indie music scene. With vibrant harmonies and equally colorful ensembles, I like to think of their music as regurgitated sunshine; they extract a honey-like sweetness from nostalgic, bitter themes. Their sound, strongest in "Fell Down the Stairs," "Sing Songs Along," and "Lost Girls," communicates the lost feeling of unembittered youth and love, while comforting the listener. And to top it all off, they have a tap dancer for a percussionist! I've been following San Francisco-based band Little Teeth for around 3 years now, and coincidentally, they've been touring with Tilly and the Wall. While their common thread is their cacophony of sounds, their styles are far from similar. If Animal Collective and Devendra Banhart are classified as freak folk, I'd say that Little Teeth falls into the circus freak folk category. Frontwoman Dannie Murrie coos, howls, screams, belts, and cockle-doodle-doos very much like a deranged rooster. True, she's not always on-key, but her voice is emotionally on target. Employing a stream of consciousness lyrical process, her fearlessness is commendable. Dannie Murrie and company are firecrackers possessed by something not entirely human. It was "Japanese Candy" that first reeled me in. Other stand-outs from recently released Childbearing Man include "Between My Ears" and "Sideways." Sam Weber has recently added some new features on his site. We can now finally purchase some of his orignal artwork. I've been saving up for the last three years of my life for an original.Hopefully I have enough.Check them out here. 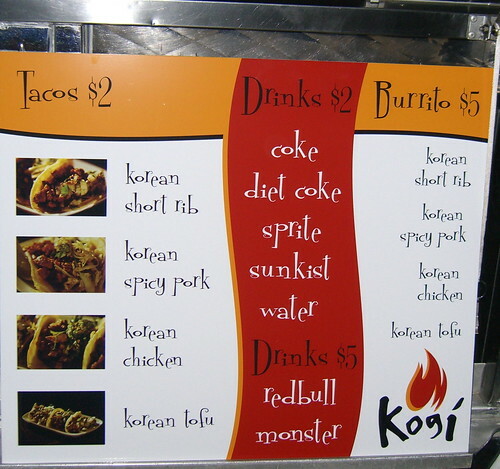 I was listening to "Good Food" on KCRW this morning and was introduced to Kogi BBQ. It's a Korean Taco truck that parks in various locations around Los Angeles serving hundreds after club and church hours. The only way to find out their location is by going on their Twitter. I heard they're going to add bacon wraped tofu chorizo (grilled kimchi is optional) to their menu soon. We should have them come to our opening show nights. Listen to the interview here. Graphic tees are sooo last year! Surprisingly Gap and Pantone opened a pop-up shop on 5th Ave in NY for all graphic designers. The shop will sell t-shirts in a range of Pantone hues.I want them all. Originally Pantone colabrated with Uniqlo in Japan a few years ago.Check out the ill capsule packaging. Check out Jon Klassen and brothers' lates creation! These four long weeks of winter break have endowed me with more than enough time to binge on marathons of Anthony Bourdain: No Reservations. His witty tongue and candidness, his willingness to immerse himself in various cultures (whether it be exploring Jamaican caves in the midst of two million bats or searching high and low for the best chicken rice in Singapore)--all of this has earned my respect and loyalty. At first, I expected Bourdain's food stops to be extra ritzy for some reason; however, quite the contrary, he seems to be more concerned with street vendors, shedding light on food that's downright flavorful, culturally intact, and totally unpretentious. Follow Bourdain on the Travel Channel. Side note: I've been looking for red velvet recipes, and wasn't too pleased with the Duncan Hines "just add water, eggs, and oil!" version. It just came to my attention that Williams-Sonoma sells Sprinkles cupcake mixes in chocolate, lemon, vanilla, and...red velvet! Life is good. I was watching a feature-length character-driven documentary called JUMP! which is about competitive jump rope that follows kids on five teams from around the country who push physical and psychological limits in pursuit of winning the World Championship. I was amazed at the level of skill and dedication these kids had. Check some clips I found on competitive jump rope. I love when various spectrums of the arts collaborate. The relatively new film label Disneynature (based in Paris, FR) released in December, a nature documentary film called, The Crimson Wing: Mystery of the Flamingos. An American film directed by Matthew Aeberhard and Leander Ward, it is a piece which seamlessly blends music and cinematography. The nature documentary takes you into the mysterious life of the flamingo--whose incredible origin is as fascinating as their alluring appearance. The music of the film is provided by a personal favorite of mine, The Cinematic Orchestra. The instrumentals of the band compliment very well, at times, with overwhelmingly expansive views of the natural environment. Crimson Wing has the potential to eclipse its equally captivating predecessor, The National Geographic Society's 2006 release of The March of the Penguins which features the hauntingly sweet vocals of Émilie Simon. When art and music work together, amazing feats in creative production can be cultivated. Tilt-shift photography is a technique that uses specialized lenses to create an extremely narrow depth of field even in large scenes. This has the same effect as shooting macro photography, so large scenes look as if they are miniatures. There are plenty of tilt-shift examples on flickr, but these tilt-shift videos by Keith Loutit are incredible! They truly approach life candidly and you can see how fragile and beautiful our world really is. MOS is a collective of architects from the States whose designs are breathing new life into modern architecture. Describing themselves as, "a collective of designers, architects, thinkers, and state-of-the-art weirdos", their team investigates the relationship between technology and subjectivity, and between design and philosophy. Their collaboration results in architecture that not only is elegantly simple, but is also profoundly complex. In an era where the aesthetics of modern are constantly being trivialized and interjected, it seems MOS has found their niche. Practicality, innovation and sheer creativity is represented by their ambitious designs and well thought out projects. From a house that floats to an ultra-modern drive-in theater, MOS is taking new steps at changing our visual environment. Oakland native and Otis graduate, Asia Eng is a illustrator based now in Los Angeles. For years now, Asia has worked for companies like Disney, Children’s Place, NZXT, Jakks Pacific Inc., etc. but her true style is far more liberated in her paintings. Eng often utilizes and interplay of nouveau elements and floral imagery. The subject matter of her work derives from her experimentation with sub-conscious dreams and narratives. Her paintings appear as though they grow organically from a single focal point, resulting in an image that is at times, difficult to contain in a single canvas. Her first solo show is at Alpha Cult this saturday, January 10, 2008. Our friend James Jean has his first big solo exhibit opening this weekend at Manhattan's Jonathan LeVine gallery. The highly anticipated exhibit entitled KINDLING: WORKS ON PAPER (AND CANVAS) opens to the public this Saturday, January 10. Jean's imaginative compositions feature ethereal figures; fluid in motion, and graceful in gesture. His fantasy dreamscapes capture compelling moments, often represented beyond the laws of gravity, on an undefined plane. Incorporating traditional symbolism and dynamic narratives, KINDLING introduces finely rendered imagery created with Jean's unique aesthetic, extraordinarily kinetic style and sophisticated color palette. The subjects, as the artist explains, glide through the tableaux, tracing a narrative of thwarted desires. His subtle yet suggestive themes of metamorphosis, mortality, and sexuality blend together seamlessly, bridging the gap between the real and imagined. I came across the work of Lisa Evans during the holiday season and I musy say, I'm a fan. A freelance artist out of the UK, her skill as a painter is as well crafted as some of the designs concepts shown on her blog. Her subjects are lucid and her light sources glow with a kind of emotion that is difficult to achieve for any artist. It appears that Evans has a certain affinity for snowy weather and gloomy skies. Whether this has something to do with her geography, I can't say; but it definitely bodes well with her style. Recently, she has been getting a lot of buzz for two paintings she put up around Christmas; but I think my favorite is still the one below. If you like some Evans work you might also like to check out artists, Jaime Zollars and Catia Chen. I'm always surprised by how few people use this neat little application on the Adobe website. Adobe Kuler is a very handy tool for designers who become stumped with colors schemes or those who need a little inspiration from other artists; I've sworn by it for a lot of my projects. This application allows users to create different colors schemes as well as interact with an entire community of color mixers. Each base color is assigned its corresponding rules (analogous, monochromatic, complementary etc.) which can also be modified to fit one's desired values. You can even upload your favorite image and build a scheme from it! Amazing. Now anyone can have a good color sense! Sort of.. This just goes to show how a simple act of crafting bubbles can result in something rather sublime and beautiful. Charlotte Sullivan is artist and designer based in Florence, MA. Her website showcases a lot of great design concepts as well as some very interesting reflections on her Massachusetts environment. Check out her website at www.hybridfloaters.com or to see more bubble drawings click here. This music video came out in 2002 so it is a bit dated, but for all of you who have not had a chance to listen to some of Yoshinori Sunahara or even been able to catch some of director Junji Kojima's work then you should definitely start now. Yoshinori Sunahara is a Shibuya-kei DJ and music producer from Sapporo whose known for his interesting melodies and synth arrangements. A lot of his songs are filled with quirky sounds and airy rhythms. Some of you also might already know the director, Junji Kojima for his humorous "Japanese Culture Lesson" on sushi. Check that out too if you get the chance.